Energy absorbing fall arrest single leg lanyard with scaffold hook. Single lanyard 1.75m from our CORE range. 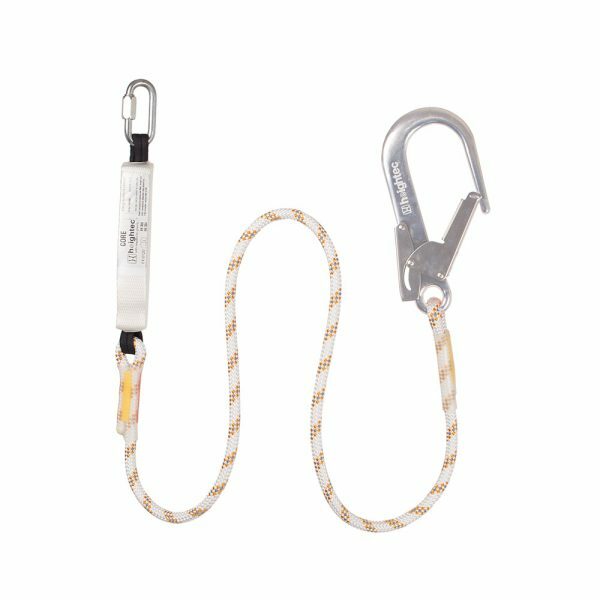 All heightec’s energy absorbing, fall arrest lanyards have been additionally tested with 125kg, 25% above the EN standard requirement. Lanyard arm made from UV stabilised 11mm TECTRA rope providing superb abrasion resistance. The sewn terminations have 22kN scaffold hook. Energy absorber sized in accordance with lanyard length and comes with 10mm screwlink for attachment to harness. Every lanyard is individually numbered. Our new improved CORE lanyards now feature a newly designed slimmer, more compact energy absorber. The absorber connector can now also be removed, allowing users to customise their lanyard. The new lanyards will be phased in over the next month or two as stock of our Core lanyards is replenished. NB: heightec do not recommend attaching lanyards to harnesses with standard oval or offset D karabiners. For our high performance lanyards please see our ELITE range. The ELITE twin lanyard arms are made from patented high twist HELIX™ rope, a new design which virtually eliminates the kinking which occurs with normal kernmantel rope versions.